Aside from decorating your home with some spooky decor and having creative costumes, Halloween also needs some scary but tasty recipes. And whether you’re hosting a party or just want to serve some fun meals to your family, there are always plenty of healthy dishes to choose. Down below are some great recipes that are healthy, tasty, and easy to make. I mean, who has the time to cook for hours when it’s already Halloween Eve? So check them out and let me know which one you like best. Get everyone in the Halloween mood with this gory but delicious pasta dish. The pasta is made with spinach, making it a healthy complete dinner recipe. Serve up a scary chicken enchilada dip before you head out for trick and treat. Topped with a grave stone shaped tortilla chips, you and the family will love it! This vegan and gluten-free dessert will get you in the mood for a frightful night. No food coloring needed, a cup of frozen raspberries will make these cupcakes look pretty bloody. Who can resist these stuffed Jack O lantern bell peppers? It looks super cute and it’s seriously healthy! The entire family will love this tasty, creamy, and cheesy loaded mashed potato casserole. This recipe is a perfect Halloween comfort meal that’s so easy and fun to make. They’re silly, easy to make, and best of all, they’re healthy Halloween treats your kids will be begging for! 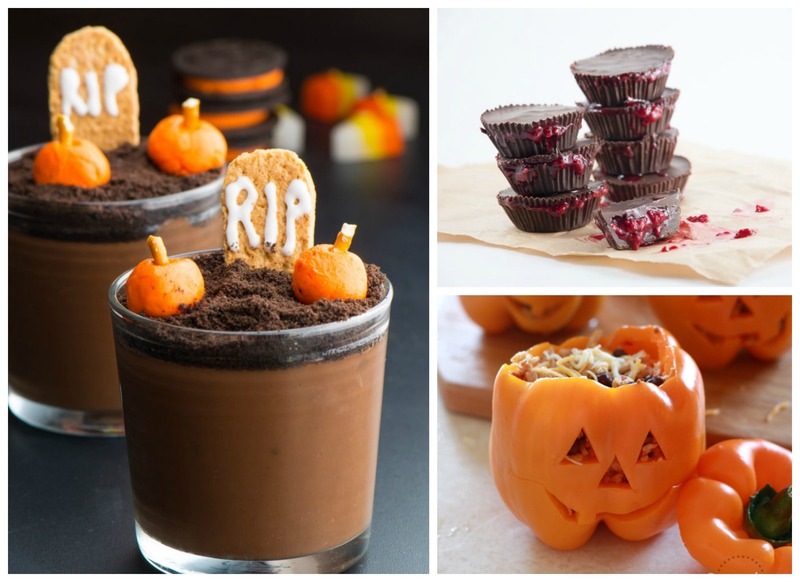 These vegan Halloween pudding cups are guilt free chocolatey treats that anyone would love. Add some art and creativity to make it an even more spooky yummy dessert. This recipe may not be the spookiest, but what’s cuter than a sugar skull topped with different fruit? It’s the perfect Halloween recipe! Finding healthy recipes during the holidays can be a little tough, but thankfully there are plenty of bloggers out there that are seriously creative! So treat your guests or family to these awesome Halloween recipes! They’re seriously cute, creative, fun, and easy to make.